His current interests include general endocrinology, diabetes mellitus, managing all forms of thyroid disease by offering the newest techniques and using up-to-date research which was developed while training at the world-renowned MD Anderson Hospital. He has a special interest in technology solutions for diabetes mellitus type 1 and type 2. With specialty training in the management of diseases of the pituitary, pancreas, bone, gonads as well as adrenal glands, he is well versed in most endocrinology issues. He is well-recognized by his patients for having an amiable disposition and a warm bed-side manner which is most noticeable in the care he takes to explain every aspect of their disease and treatment. Dr. Jogi's wife, Dr. Reena Jogi, is a successful Houston dermatologist. He is double board certified and an active member of numerous national endocrinology societies including the American Thyroid Association, American College of Clinical Endocrinologists, Texas Medical Association, Harris County Medical Society and the American College of Physicians. He is also a Clinical Assistant Professor teaching for the Baylor College of Medicine Endocrinology Fellowship training program. He is an advisor for physician centric health management systems Prescribewell and Luma Health. He is also an advisor to the TMCx Innovation Institute and is the medical editor of www.Houstonendocrine.com. 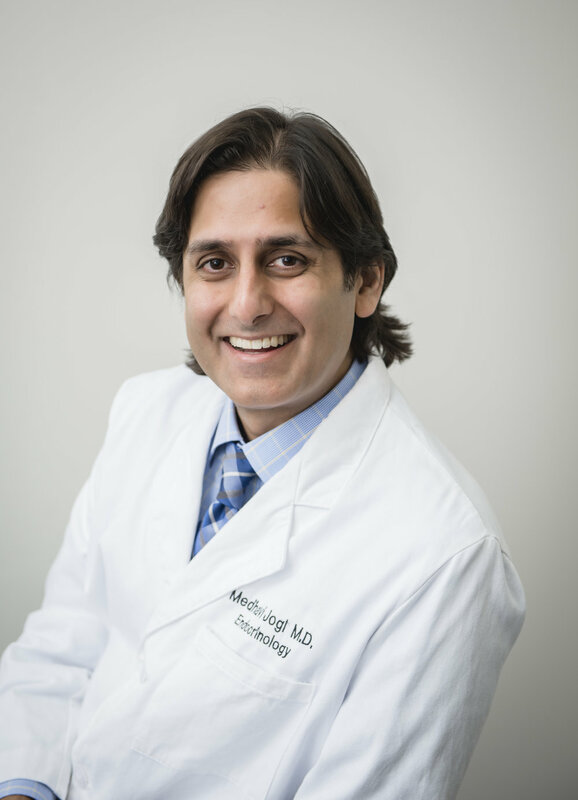 Dr. Jogi strives for excellence in the diagnosis and treatment of all hormonal disorders by combining the most recent advances and techniques with a compassionate approach. We specialize in disorders of the endocrine system. The physicians and staff of Houston Thyroid and Endocrine Specialists go to great lengths to care for each and every patient and spend time listening to and addressing all questions and concerns. Learn about our practice: why choose us? The information contained herein should NOT be used as a substitute for the advice of an appropriately qualified and licensed physician or other health care provider. The information provided here is for educational and informational purposes only. In no way should it be considered as offering medical advice. Use of this website does not establish a patient-physician relationship. Please check with a physician if you suspect you are ill.